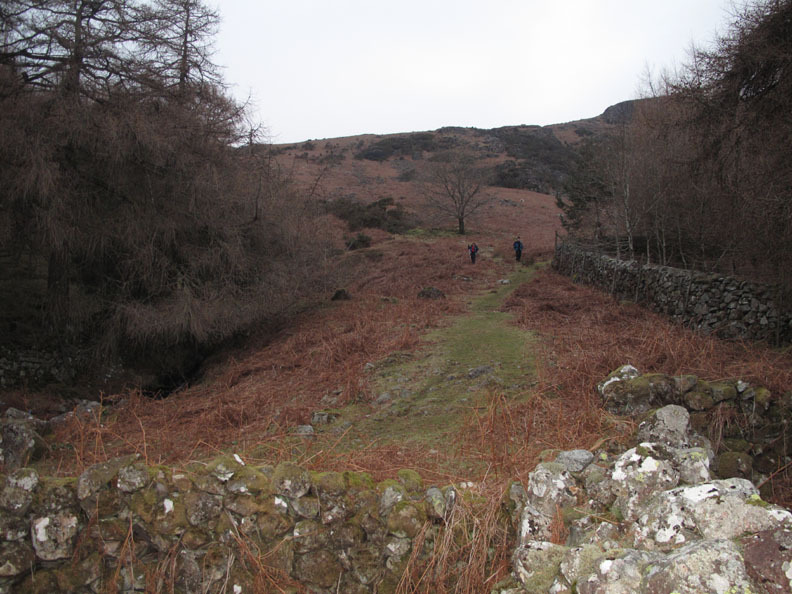 Places visited : Buckbarrow, Glade How, Cat Bields, Seatallan and back. 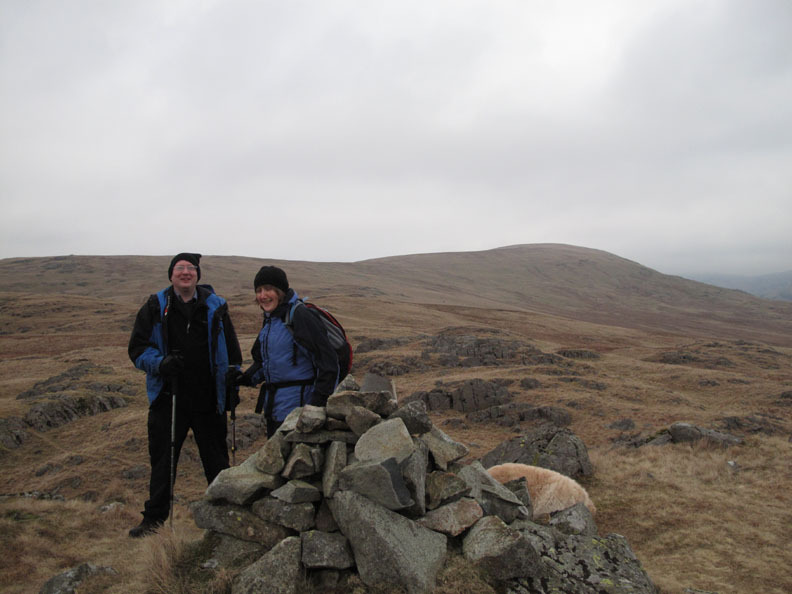 Walk details : 5.6 mls, 1980 ft of ascent, 4 hrs 55 mins including lunch. 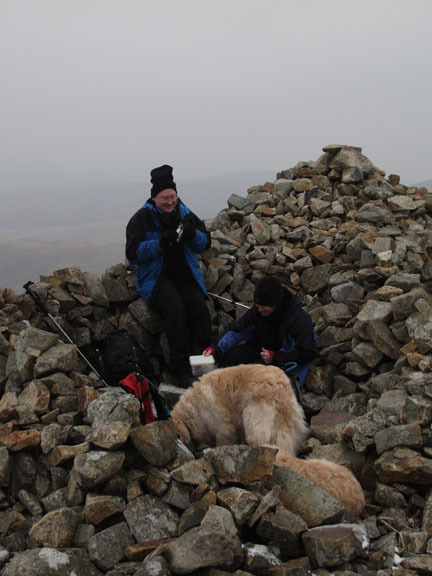 Highest point : Seatallan Fell, 2266 ft - 692 m.
Walked with : Ian (Smith), Ann and the dogs, Harry and Bethan. 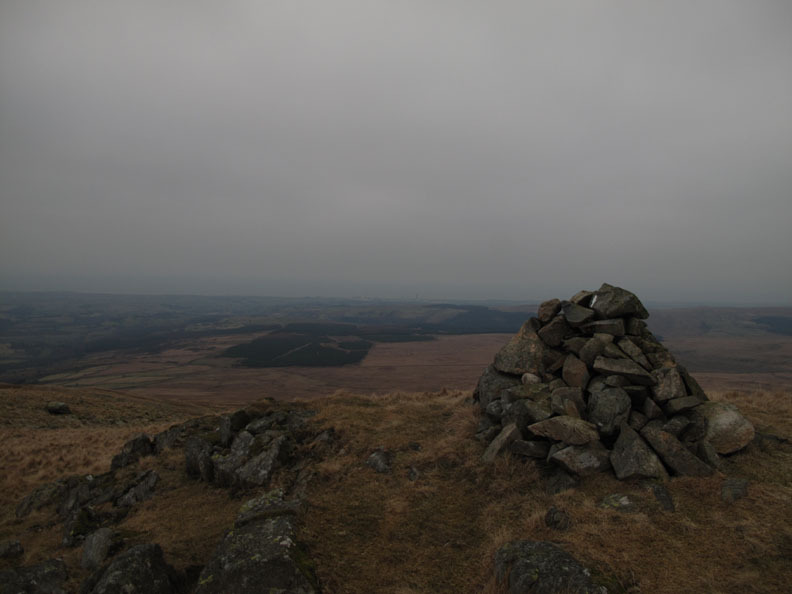 Weather : Overcast and grey, hint of snow on Seatallan, a cold breeze up high. After yesterday's fine weather we take a drive down the west coast and join with Ian for a walk in Wasdale. 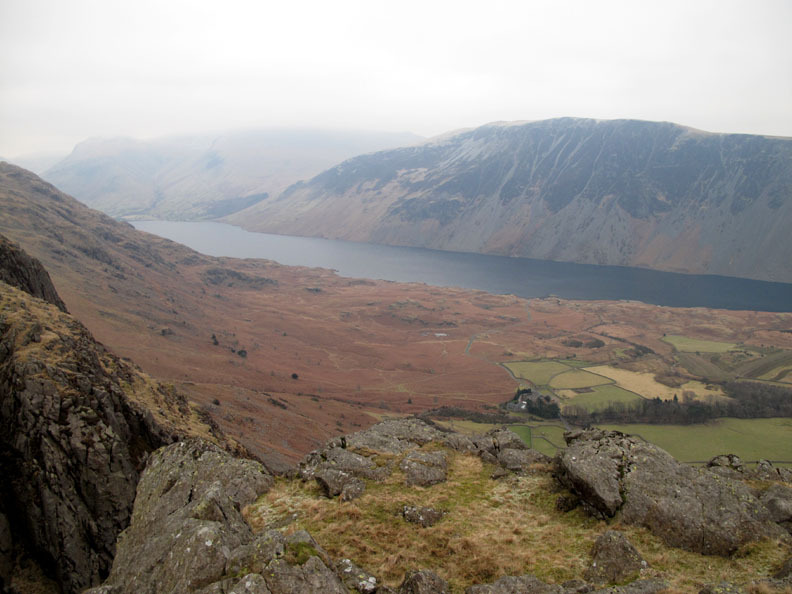 We often missed out Seatallan when climbing Buckbarrow so today was the day to put that to right. Pity about the change of weather ! A cold looking Cold Fell . . . as we drive down the west Cumbrian coast to meet up with Ian. Whatever happened to those blue skies and rich sunset days ! 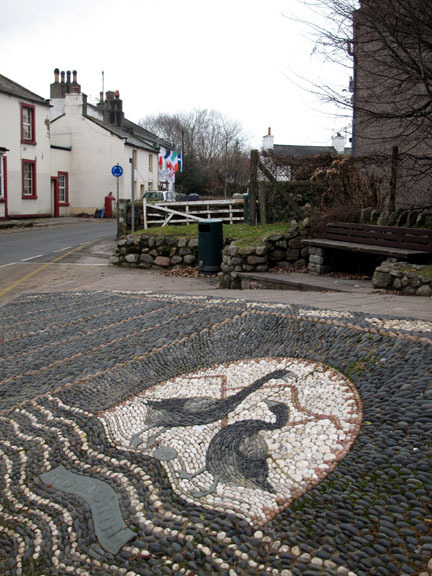 Mosaics at the meeting place in Gosforth. Rough ground at the parking place in Nether Wasdale. 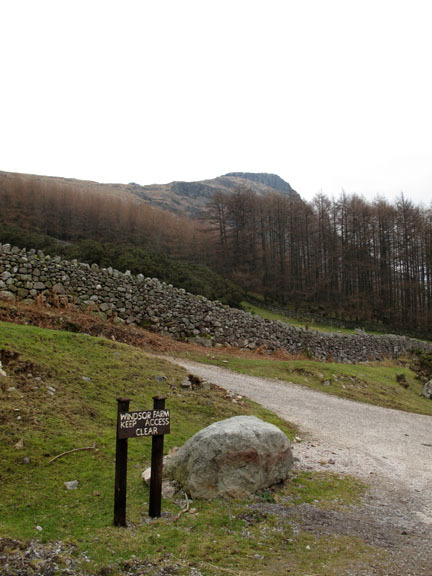 as we started our climb where Gill Beck cascades down from Buckbarrow. As we gain height we get our first glimpse of Wast Water . . . close under the Wasdale Screes. 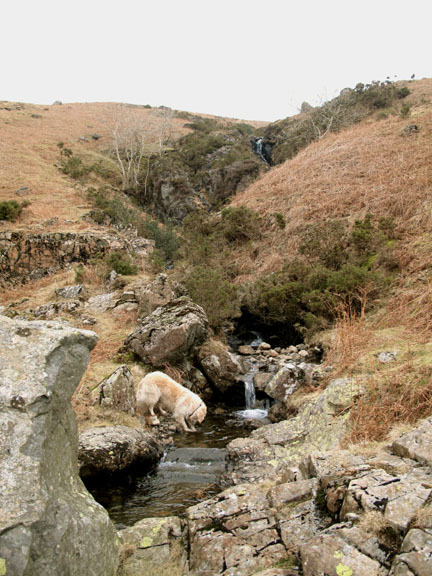 Harry samples the water at one of the waterfalls. 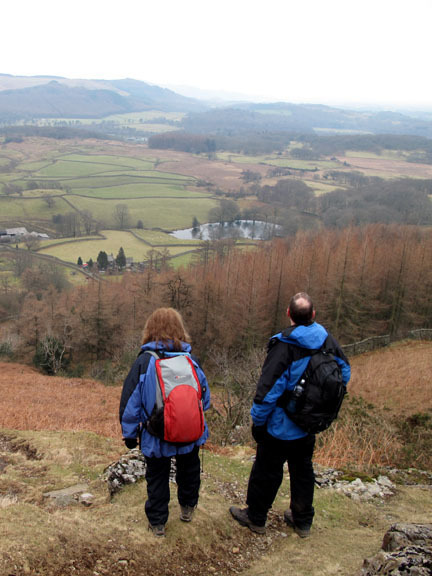 Ann and Ian stop to admire what they can of the view. 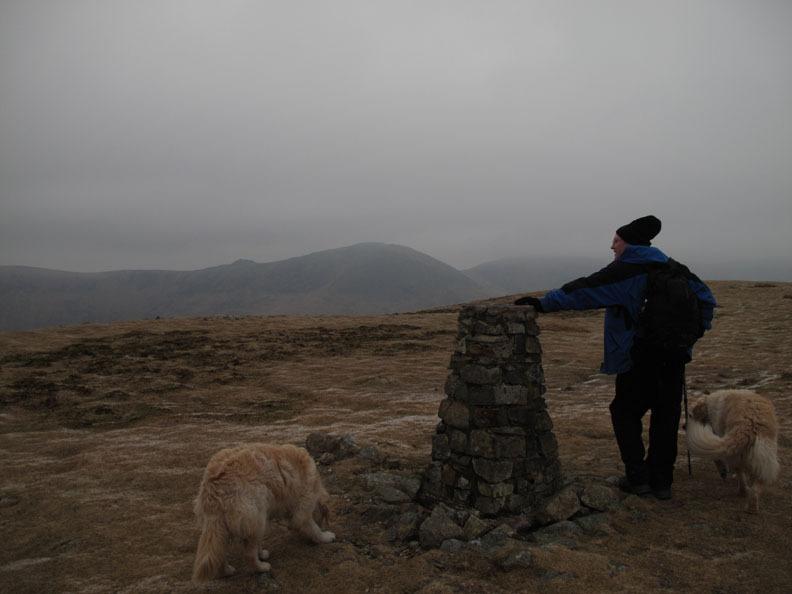 The summit of Whin Rigg at the western end of The Screes. 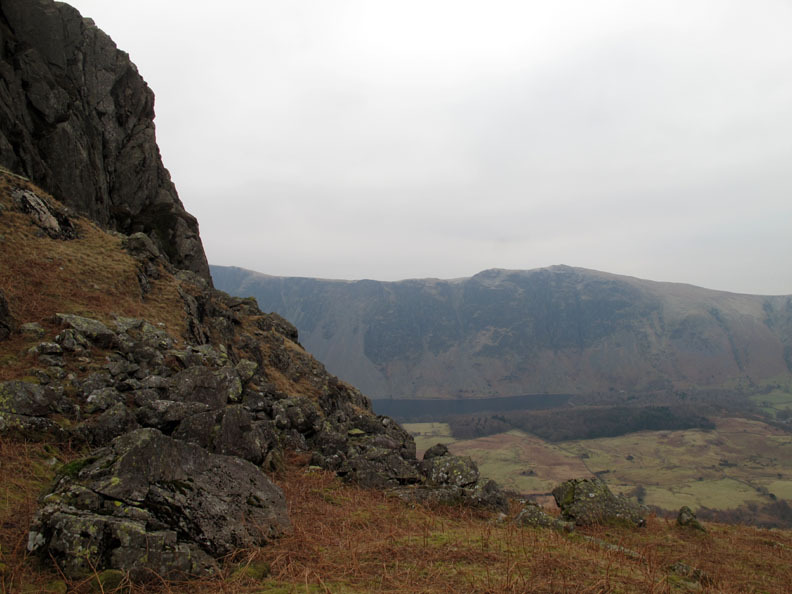 The crags on this side prevent us from taking a direct line to the viewpoint on Buckbarrow. There was an interesting angled chimney . . .
. . . but we declined in favour of a grassy rake alongside. 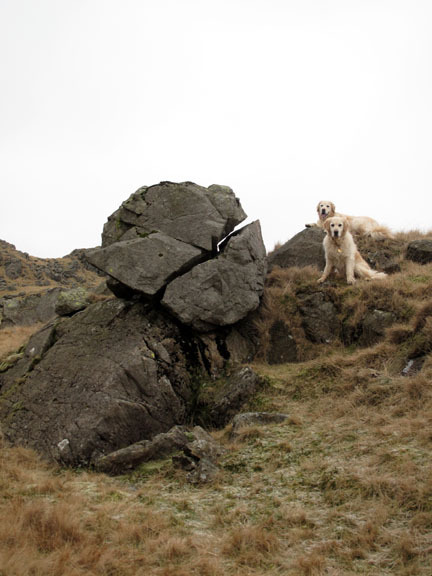 Close to the top, a split perched-boulder alongside the path. A diversion to the edge . 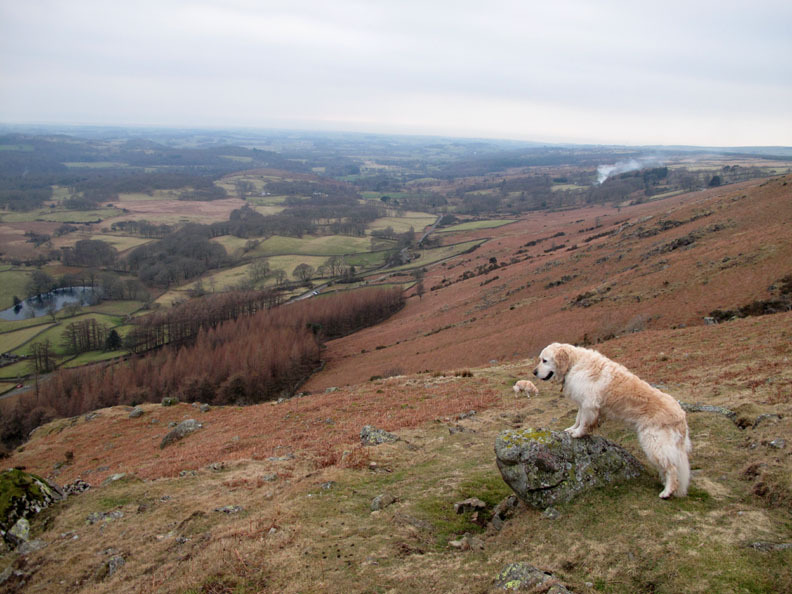 . .
in order to better appreciate the view over Wasdale Valley. Far below us now . 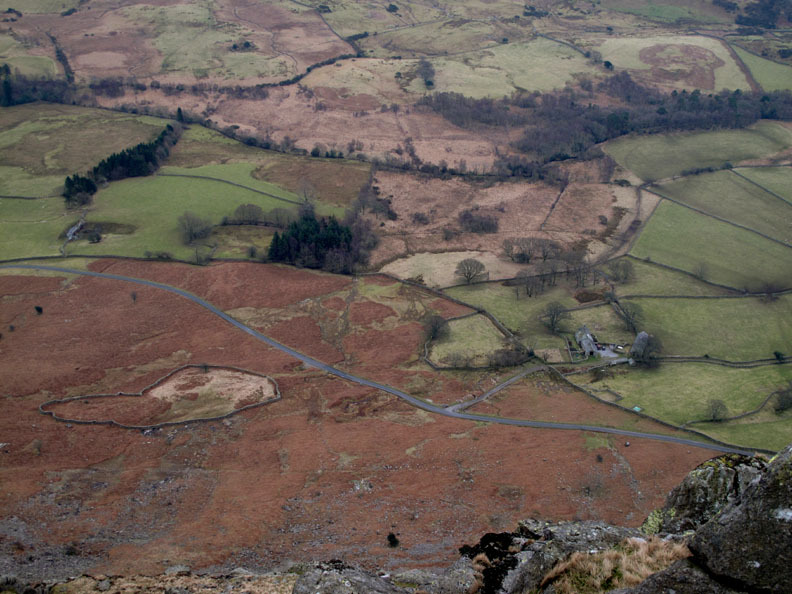 . . Buckbarrow Farm and its patchwork of fields. 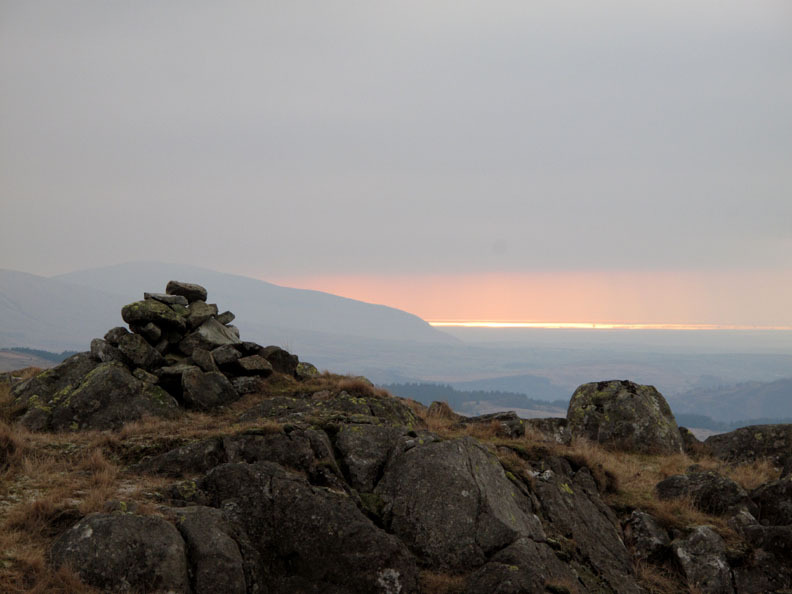 The view extends from the Scafells on the left to Black Combe on the right . . . both of which are topped in cloud. To be fair, there was sun about . . . but just not on us. Morcambe Bay would seem to be the place to be for a bit of fine weather at this point in time. 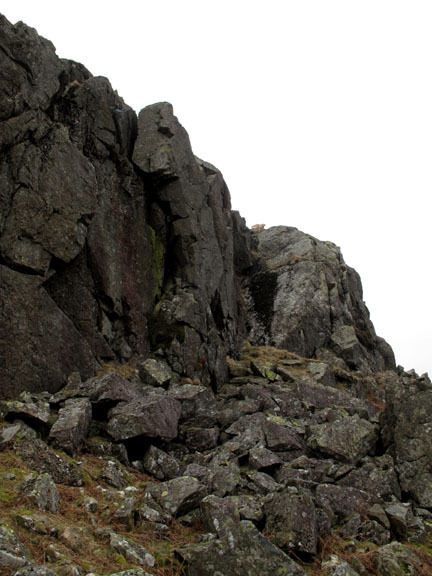 Still we are in good fettle as we reach the upper cairn on Buckbarrow. 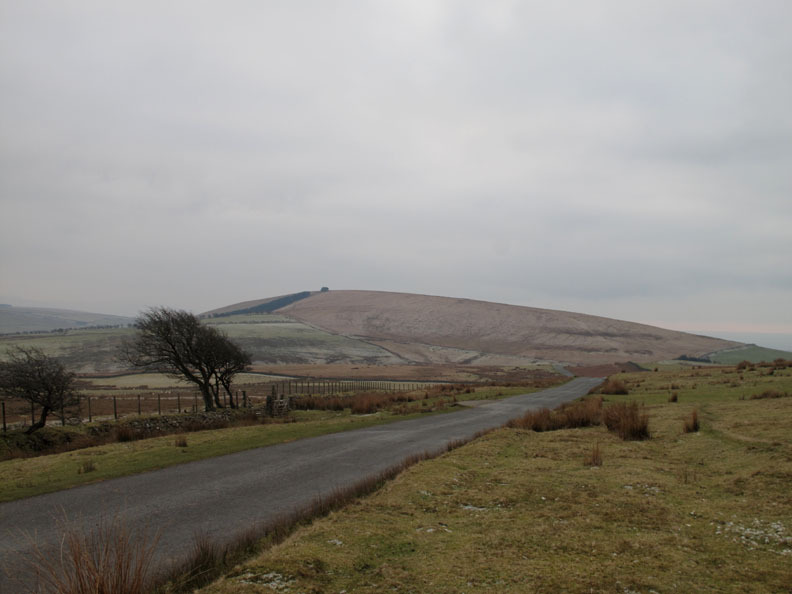 Our plan is to walk up to Seatallan which can be seen in the background. Another crag, another rather fine cairn . . . this one was on the top of Glade How. 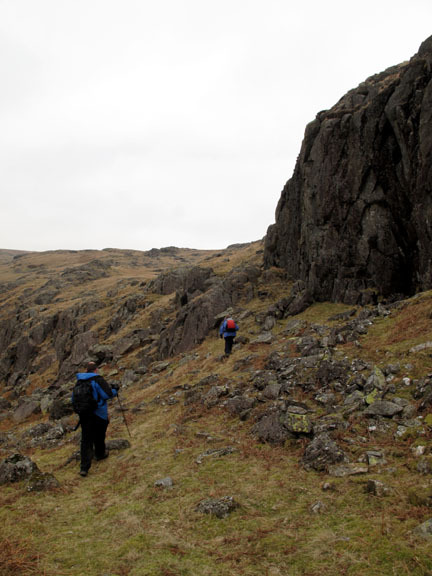 In the background is the minor top of Cat Bields, the rocky outcrop on the western end of the Seatallan ridge. 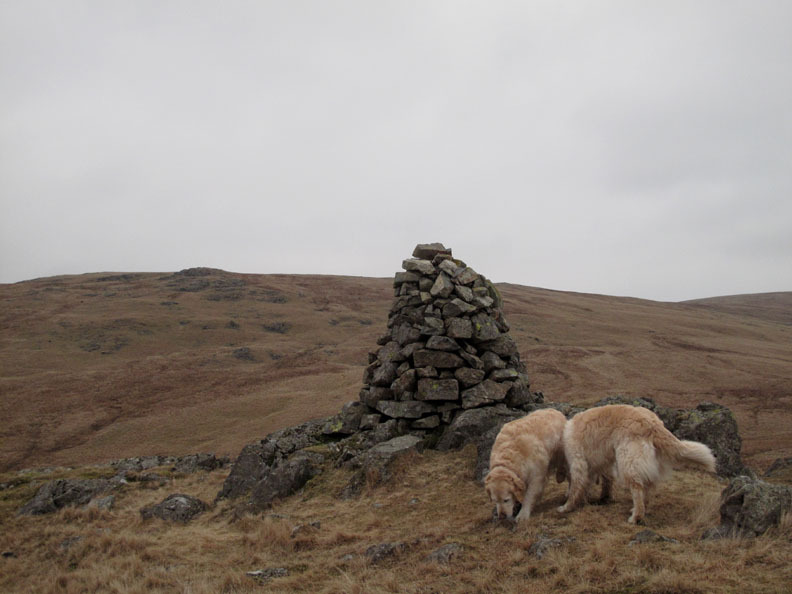 Jumping forward in time to the next cairn . . . to be fair there wasn't much of interest to photograph in between ! Cat Bields would imply an animal enclosure or den of the cats. 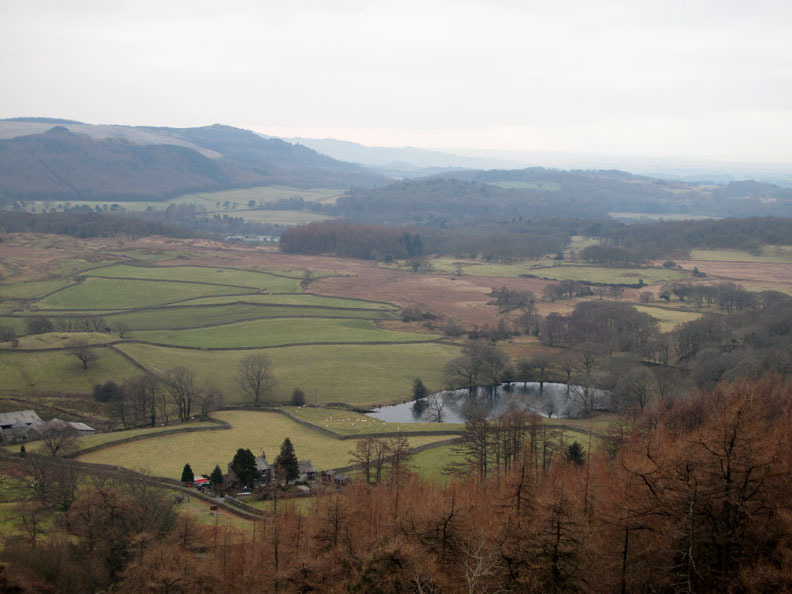 The name of the popular fell Catbells, near Keswick, is thought to be derived from the same meaning. Easy walking on a lightly defined path made the upward rise to Seatallan very straight forward. 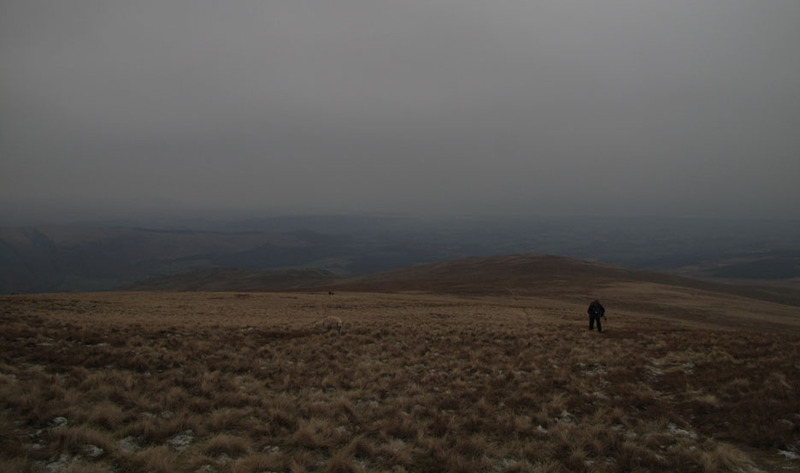 As we climbed however, the temperature dropped and the skies became a little more leaden. 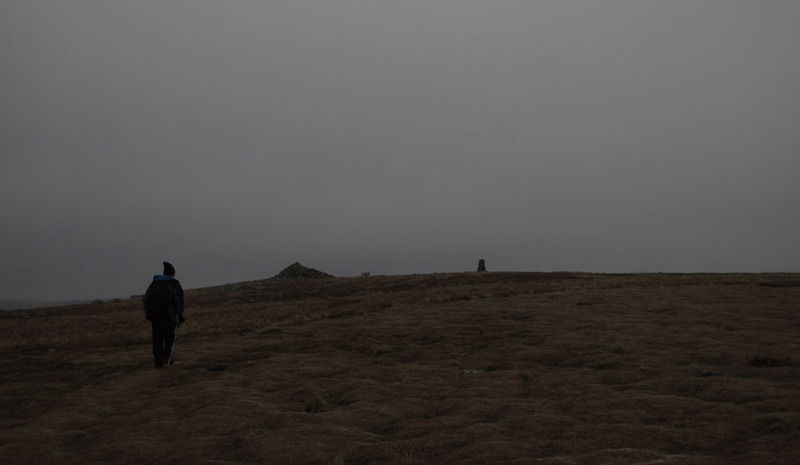 Ian walks towards the trig point at the top of Seatallan. A gentle but steady breeze and temperatures hovering just below freezing made the slight mist turn to tiny snow flakes. A good pair of gloves and a hat were essential. We could recognise everything . . . but all the features were missing. I could just make out Scoat Tarn on the side of Red Pike. 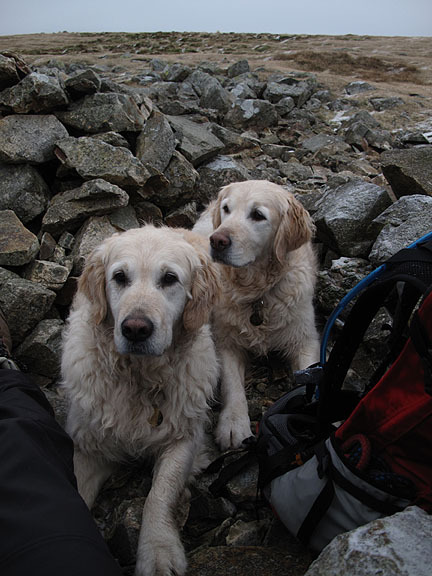 We retire to the summit shelter for our lunch . . .
. . . hope we've brought the dog biscuits ! Mmmm . . . even that pleasant delay didn't allow the weather to improve. 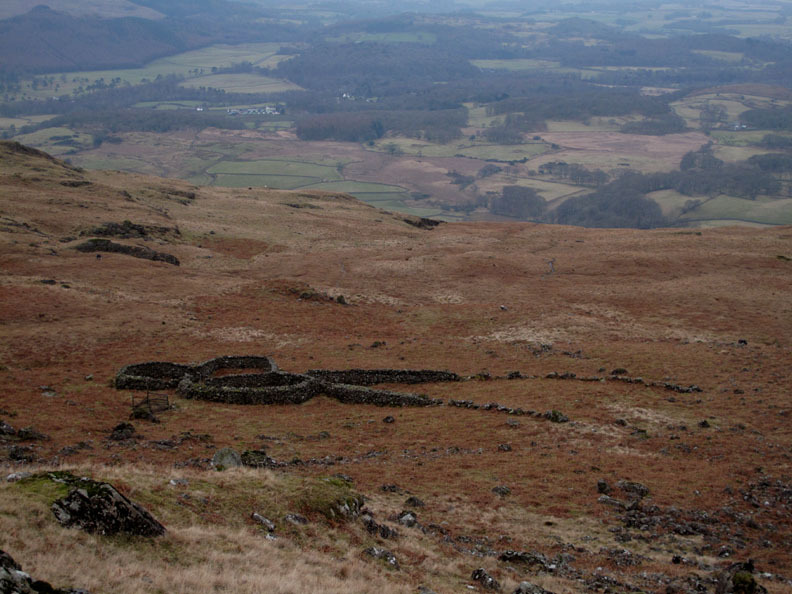 This is the view south from the slopes of Seatallan as I go in search of a vantage point for Greendale Tarn. 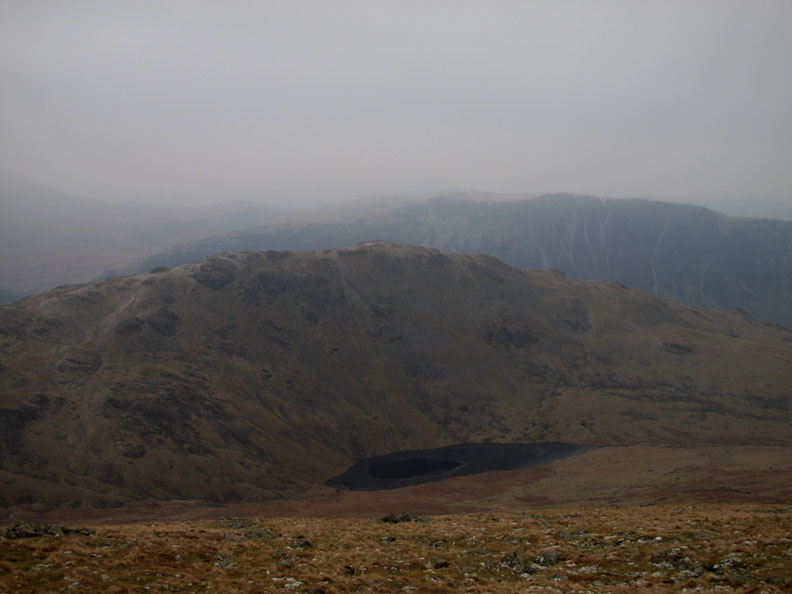 Middle Fell and the partly frozen Greendale Tarn nestling at its base. 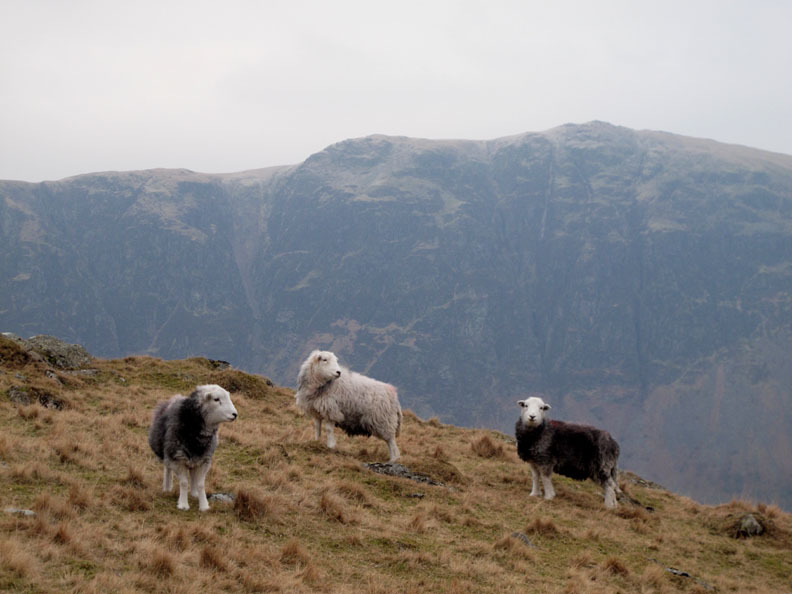 Three locals watch us as we pass on our way back to Buckbarrow. 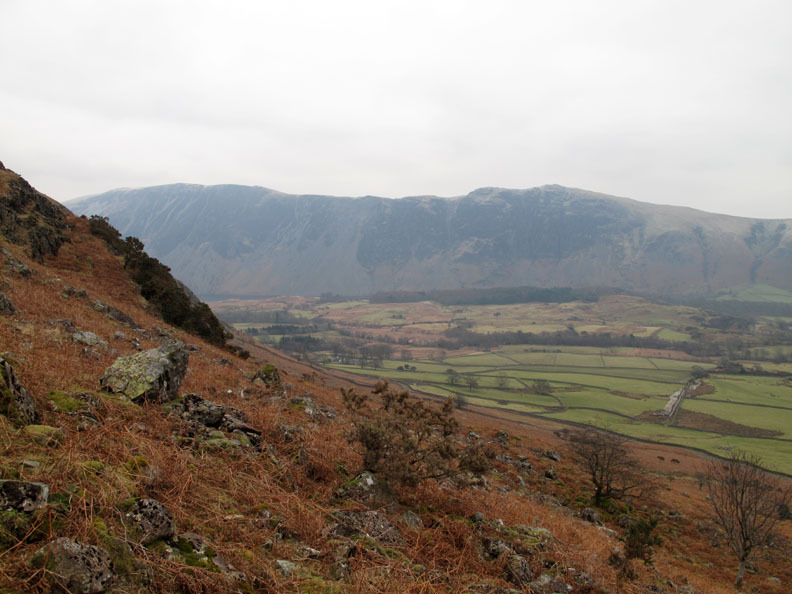 Behind is the eastern summit of the Wasdale Screes Ridge . 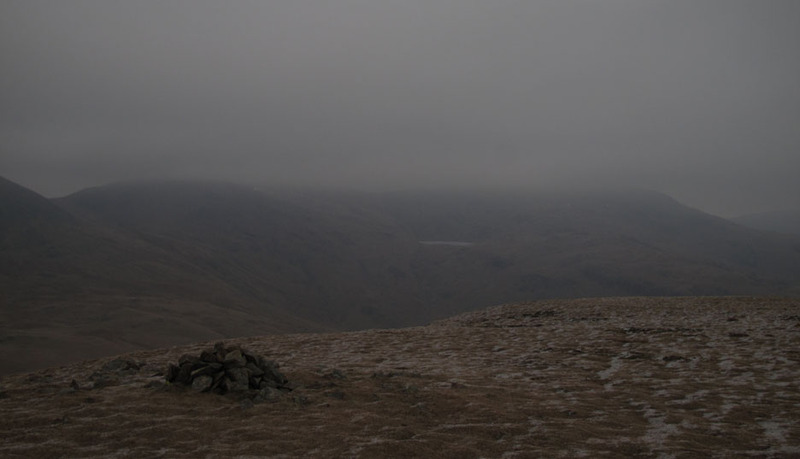 . . Illgill Head. 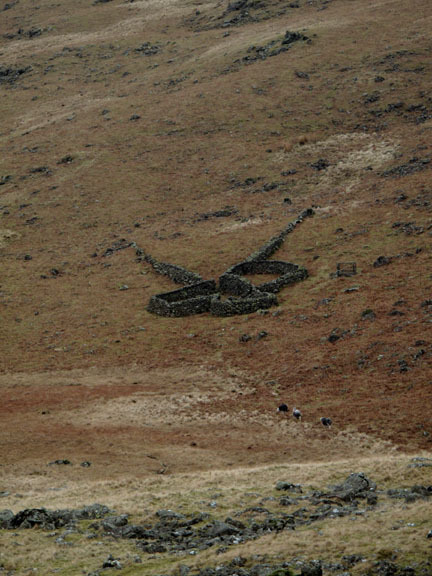 A slight detour takes us directly down past the "shamrock-shaped sheepfold" we saw earlier. 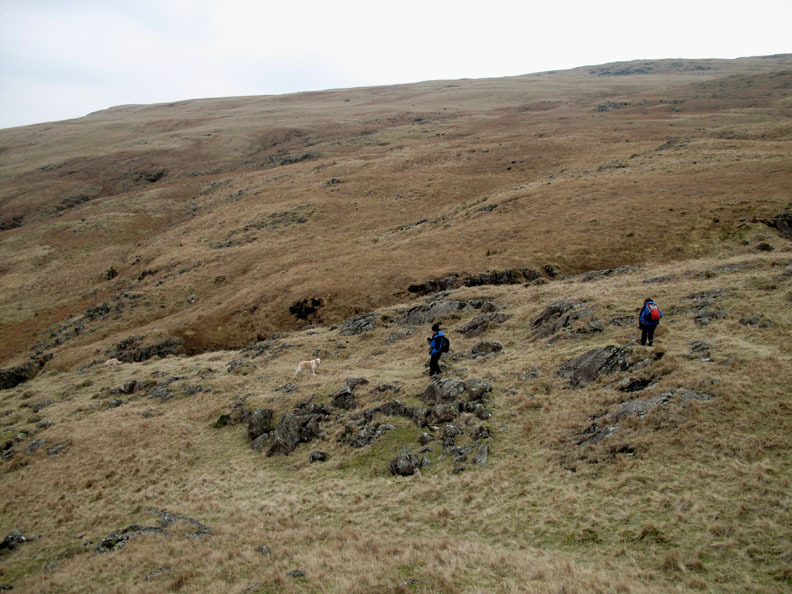 We locate the headwaters of Gill Beck amongst the many rocky outcrops and start our descent back to the road. The car is the bright dot above the trees. 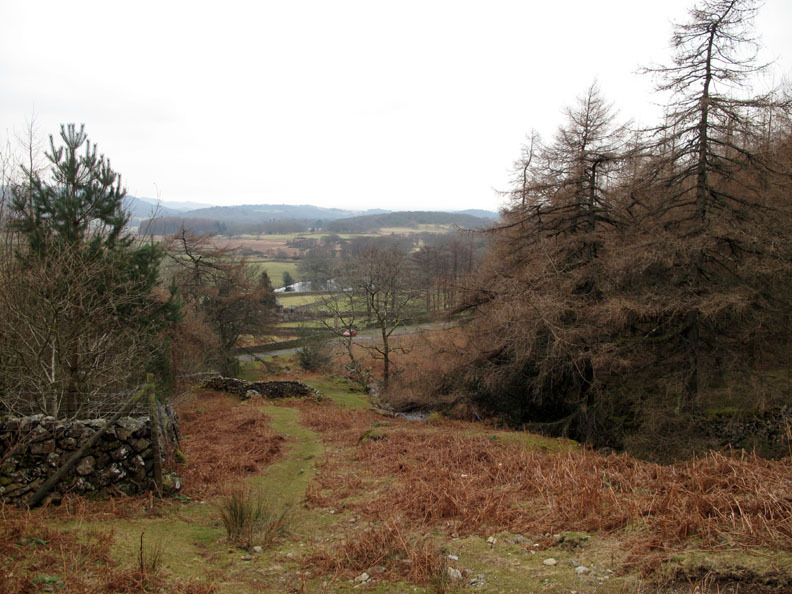 as many of the boggier and deep mossy sections were still frozen enough not to be a problem. brings us back down to the road at the end of the walk. This site best viewed with . . . a warming cup of tea afterwards . . . thanks Ian.